It’s rich, it’s delicious and it just melts in your mouth. 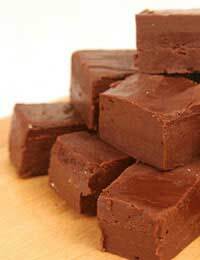 There really is nothing quite like fudge – and there really is no reason not to make it without using sugar. These sugar free chocolate fudge recipes may be prepared using rather different methods from traditional fudges but they are just as tasty and will be polished off just as quickly. When stored in the fridge, they will last for days and days, and when wrapped in paper, placed in a gift box and given to a friend or loved one, they will be greatly appreciated. This sugar free chocolate fudge recipe calls for peanut butter. Do remember to check the label on the jar, however, as many peanut butters contain sugar. Try buying a whole nut variety from a health food shop. Those who are not fond of peanuts can substitute the peanut butter with cashew nut butter or hazelnut butter – again, often available from a health store. Take a medium pan and in it place all your ingredients. Slowly warm on a gentle heat, stirring all the time. Keep stirring as all your ingredients dissolve, until you have no lumps left in your liquid, apart from your chopped nuts from the peanut butter. Remove from the heat and pour into a greased fudge tin. Allow to cool then place in the fridge over night. Once set, you can cut it into squares – and enjoy! This is a rather unusual sugar free fudge – but it is absolutely delicious. It makes a sweet that is very soft and will simply dissolve when you pop it in your mouth. Beat your cream cheese and sugar free strawberry jam together in a bowl until light and fluffy. Stir in your cream then sieve your cocoa and mix that in to. Beat your mixture for two minutes, ensuring all the cocoa is well mixed in. Spoon into a greased fudge tin and leave in the fridge over night to set. Turn out the next morning and cut into squares. In this recipe you can use an artificial granulated sweetener. Don’t forget to read the manufacturer’s instructions first, however, to ensure it is suitable for use in cooking. Melt your butter, cocoa and sweetener in a large pan over a low heat. Stir until completely dissolved. Add your ginger and vanilla essence and then stir in your cream. Keep on the heat, stirring all the time, until you have a smooth liquid. Pour into a greased fudge tin and allow to cool. Then place in a fridge over night to set. Cut into squares the following day.